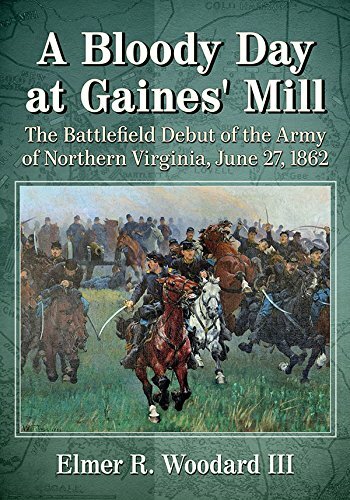 • A Bloody Day at Gaines' Mill: The Battlefield Debut of the Army of Northern Virginia, June 27, 1862 by Elmer R. Woodard, III (McFarland, 2019). From the description: "In the summer of 1862, two great armies met outside of Richmond in a series of battles that would determine the course of the Civil War. The Union had time, men and materiel on its side, while the Confederates had mobility, esprit de corps and aggressive leadership. Untried General Robert E. Lee was tasked with driving the Yankees from their almost impregnable positions to save Richmond and end the war. Lee planned to isolate part of the Union Army, crush it, and then destroy the only supply base the remaining Federals had. To do so, he had to move thousands of troops hundreds of miles, bringing multiple forces together with intricate timing, all without the Yankees or their spies finding out. The largest and most important of these battles occurred at Gaines' Mill." Though a R.E.L. Krick project has been long brewing in the background, Elmer Woodard's A Bloody Day at Gaines' Mill: The Battlefield Debut of the Army of Northern Virginia, June 27, 1862 is the first book-length study of the battle to reach publication. Originally scheduled for late summer 2018, it was just released earlier this month. So far, I've only read the preface (which you can peruse yourself at the title link above) and quickly glanced through the maps and orders of battle. The preface is interesting to say the least. I wholeheartedly agree with the author that no existing account has been truly satisfying but don't believe the current state of knowledge to be nearly as dire as claimed here. Brian Burton's Gaines' Mill section of his Seven Days study provides a very fine summary of the battle, and I don't think that there is some kind of cult of Freeman that dominates thinking elsewhere. It's quite a stretch to take goofy mistakes from Freeman and a couple very minor secondary sources and paint the entire battle historiography in such fashion. Anyway, all that stuff aside, I'm looking forward to reading the book. I am curious to see how the main battle narrative's scrapping, for purposes of discussion, of historical organizational relationships in favor of a modern "battle group" structure (on the supposition that that will aid reader comprehension of the intermixed jumble of brigades and divisions that crowded the battlefield) will work out in practice. The maps look great and the information level of the orders of battle is unusually high (with regimental strengths and battery compositions all presented). I had a chance to look at the intro for this one as well Drew. I was also skeptical of the "Battle Group" idea. It may me think of the Albert Castel present tense gimmick in his Atlanta book. I'm not confident this is going to work well, and I am quite confident this is not going to be the new normal in battle studies. Even though I buy some Civil War titles I really want to read, and get sent a decent number by different publishers (and I review some of them even though they are competitors), McFarland never sends me anything. But at 40 bucks for a paperback with perhaps 250 or fewer pages of substance, I won't be buying this one. I only learned later on how much the present tense writing bothered so many readers. It seems like a practice that would annoy me, but I don't recall having had any feelings like that. It must have grown on me, too. I wonder if it would affect me more on the second go. One of the drawbacks of maintaining this site is I never have time to reread favorites from the past. Ted: I concur regarding Castels present tense approach. At first it seemed like a gimmick to me but I got used to it fairly quickly. I'm more concerned about somebody playing artificially with an OOB by using organizational concepts which were developed some 80 years later for a variety of reasons. I guess we'll have some idea after Drew reviews it. Drew: I'll reserve judgment until I see your take on this "battle group" approach but I share Brett's skepticism. It seems to me that it's likely only to generate further confusion. How many maps are there and who is the cartographer? The preface also leads to some concerns. The author seems enthusiastic enough but dismissing someone like Burton as an "egg head" who can't write a solid battle narrative because he's never "bitten off a cartridge" raises questions. There are 19 from Hal Jesperson. He certainly took commissioning maps very seriously. The egg head comment was another one which certainly had me raising an eyebrow. Hi Drew, I get what you mean about not rereading favorites. I barely have time to read at all outside my chosen profession. What is this egghead comment? Who made it? I didn't see it in Drew's overview. Surely the author (who used to publish with us and with whom our collaboration scored him a Douglas Southall Freeman award) did not write this in his Preface? Ted, I dont have the book in front if me, but the author did put into print that another author was an egg head, and made comments inferring reenactors are superior to others when writing these minds of battle books. I cant speak to his intent, but it certainly isn't a good look, at least in my opinion. I just read the introduction he says: "All of these authors were 'egg-heads,' to purloin a phrase originated by Jefferson Davis Futch, Ph.D.m of Washington and Lee University." He is saying this about Pollard, Freeman, Dowdey, and Burton. He then goes on to say that these men had less of an understanding of the battle because they didn't understand small level tactics or soldier experience. The comment seemed more tongue-in-check than some of the above comments made it seem. I took it as unwise jocularity, too, unwise in the sense that the word is typically used in a negative context and few readers will be familiar enough with the author's personality to infer intent. But who knows. It really didnt read tongue in cheek to me at all. Your mileage may vary. The trick to being facetious is to make sure that your statement comes across that way. This did not. That begs the separate question how on earth he would know that Brian Burton "had less of an understanding of the battle" because he hasn't participated in a re-enactment. I can steer you to several Civil War historians who have a full understanding of tactics and operations which they've written about and haven't spent 2 minutes "biting off cartridges". In fact, some have taught at West Point and at the War College and have conducted staff rides. Mr. Woodard should consider himself fortunate if his book rises to the level of their work. An author who intends to be taken seriously should not refer in a preface to other authors who have produced solid work as "eggheads" who are incapable of correctly analyzing tactics because they haven't engaged in re-enacting. It wasn't a blog post - it was the preface to the book. In my humble opinion. And everybody is looking forward to Drew's assessment.